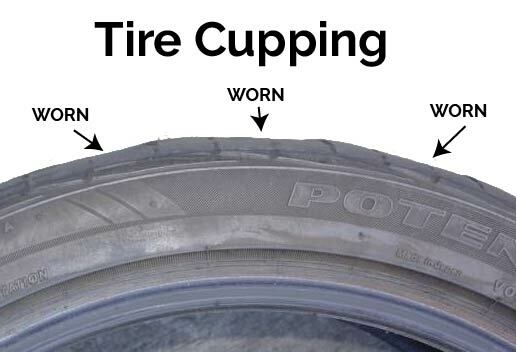 What are the Causes of Tire Cupping? Low-quality tires: This is amongst the primary reasons for why your tire suffers cupping. It’s very simple; the premium car tyre is of higher quality and better able to resist chipping by the environment and prevents cupping. Suspension: Even though you have high-quality premium tires, it’s still likely to get affected by cupping if there’s errant suspension on the vehicle. As the vehicle moves, the suspension allows tires to bounce. Due to which, you’ll soon notice the scuff marks on the tire’s surface that’ll result in cupping. Alignment: In case you happen to find cupping only on the rear wheel, the chances are that there might be some problems with the vehicle alignment. Make sure you inflate your car tires to 40 pounds in case they are rated 30 to 35 pounds & you see visible cupping on them. In most cases, cupping occurs on the outside. Therefore, place the cupped side on the opposite side by rotating the tire, so the cupped side goes inside. You might need to replace the worn or faulty suspension part to prevent cupping. Make sure to replace parts like struts, CVC joints, ball joints and wheel bearings etc. Try consulting the experts to find precisely which suspension part has the problem and can eventually result in tire cupping. If your car is wearing the cheaper and low-quality tire, you should replace it with more expensive ones. Try buying quality tires that have the solid rubber formula on the sidewall. How to Repair Tire Cupping? Set the emergency brake and identify cupped tire by examining them all one by one. Check in case the cupping is on the front tires. Misalignment of the front side can be the reason when the cupping is on the inside of the tread. Take your vehicle for proper alignment. If the tires have the Greater surface area, the sponginess and bounce will be reduced. Therefore, consider switching to wider tires and rims. Keep in mind; alloy rims have an extra benefit of enhanced styling. Pick the tires that are unidirectional as they were designed to provide maximum traction along with better road-gripping characteristics and handling. If you use the high-quality rubber tire, it’s will automatically reduce the chance of tire cupping problems.